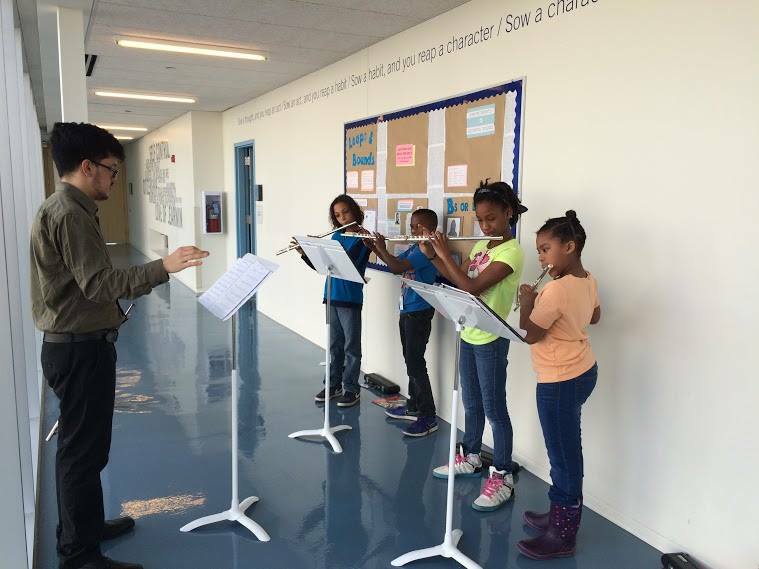 Flutist Ryan Zerna works with students at The People's Music School. CSW brass players perform quintet arrangements at the Winthrop Harmony Arts Garden. Flutist Ryan Zerna, saxophonist Richard Brasseale, and clarinetist Melissa Morales perform a woodwind trio for students at The People's Music School. Concert photo of CSW Musicians at the November 2015 performance of Autumn Winds: Works for Woodwind and Brass Ensembles. Concert photo of CSW Musicians at the February 2016 performance of Symphonic Music for the Wind Ensemble. CSW volunteers help guide a young audience member through a hands-on activity as part of CSW's Shakin' It In the Parks as part of the Chicago Park District's Night Out in the Parks series. CSW brass musicians performing quintet arrangements outside the Museum of Contemporary Art as part of Make Music Chicago Day on June 26, 2015. CSW performing at Women's Park in the South Loop neighborhood as part of the Chicago Park District's Night Out in the Parks series. Trumpeter Gregory Strauss works with a student at The People's Music School. Concert photo of CSW Musicians at the May 2016 performance of Masterworks for the Wind Repertoire. Concert photo of CSW Musicians at the April 2015 performance at Orchestra Hall at Chicago's Symphony Center as a featured ensemble with USBand's Concert Series.